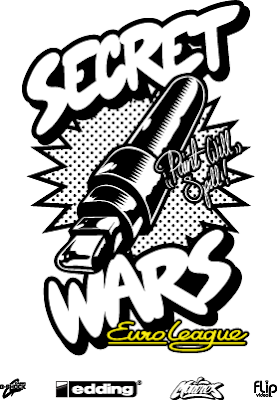 Get your hype hats on, the Secret Wars Euro League has arrived. The format has evolved this year from the previous 3 series...i still haven't got my head round how it all works but basicly instead of individuals going head to head each participating city has a team of artists. Anyway I will be representing london alongside Mr Gauky, Alfa, Wen, Flawn, and Tony Riff. Rather than a knockout cup comp, we have decided to make this a little more interesting and maybe fairer - Each game will be a league match with each judge vote and crowd vote worth a point! With the top two teams going through from each group, we will be left with 4 teams. The winner of GROUP A will play the 2nd place of GROUP B and the winner of GROUP B will play the runners up of GROUP A. These will also be home and away ties - with the winning team decided on total points earned over the two games. If the points are level than it will be decided by the team who gets the most away points. This will be hosted at a neutral venue, TBC nearer the time"
It all sounds a bit too football if u ask me!